I received products for post. The opinions within this post are of my own and I was not influenced in any way. Please do your own research before purchasing products or using services. Your opinions and results may differ. The Book of Life, released to Blu-ray and DVD, January 27th tells of a man named Manolo that goes on a quest to reunite with his true love and defend his village. Showing the beauty of the Latin-Mexican culture, The Book of Life goes outside of the box and is unlike other family-friendly movies. The storyline is original, the characters are likeable, and the graphics are vibrant. Viewers are entertained and even schooled on the Mexican holiday Dia de los Muertos (otherwise known as "Day of the Dead"). 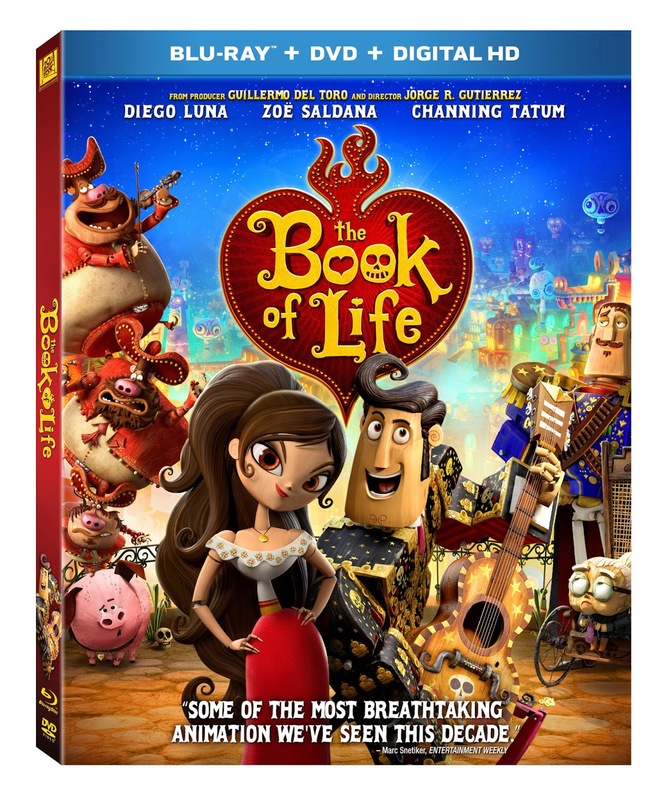 Over the weekend I held a Book of Life Family Movie night. Two of my nieces joined the rest of my family to watch the movie and feast on Mexican food. Everyone found the movie to be entertaining. Although the first month of the year is over, we went over our New Year's resolutions and upcoming goals after the movie had ended. It made for great conversation and I was able to get insight on how my kids' want to improve in life aspects. Character masks were donned throughout the evening while we discussed our views on the movie and learned more about a diverse culture. I'd say it was a successful movie night! Have you watched The Book of Life? What family-friendly film do you recommend for our next movie night? that looks like a fun family night! I like how you added snacks to match the movie theme and masks! How fun is that! We don't have little kids at home anymore and we are not grandparents either so I don't have any good movie suggestions. I like the classics like Beauty and the Beast and the Sound of Music. Have a great week! I like how you turned movie night into a family night instead of just popping a moving into the DVD player. Does the movie come with the character masks and New Years questionnaire? Thanks! My son wants to see this movie and I think we'll take your lead. We are always just popping in a movie but I love the idea of making it more of an event. Thanks for the idea! I saw a trailer for this last year but wanted to wait for reviews, and then forgot about it. I'll add this to Netflix since I'm running low on ideas. What a great idea! I spent a week in Mexico with my family between Christmas and New Years. We were in Puerto Vallarta which is a great place to visit because the resorts are near or in town and the people are so kind and welcoming. It was a great way to learn more about Mexican culture and put my three years of high school/college Spanish to work! I love to travel and think it's so important to learn about other cultures besides our own. Good stuff! That is such a cute idea!! I have not watched the Book of LIfe yet. I have not even heard of it before. I don't have kids, but my 6 year old nephew would probably be interested in watching it! That looks like so much fun! My kids are all older now, but I actually miss watching kids movies like this. It looks like your family had a blast! Thanks to the snow I won't be getting outside anytime soon. That leaves me to wonder if Book of Life is out on Netflix. Thanks for sharing! Oh this is so cute! I haven't seen it yet, but I have a feeling my son would love it!! This sounds like a cute movie. You can't go wrong with Channing Tatum, even if he's only doing a voice. Awesome, I think my boys would love that! We are usually watching the lego movie with my boys. I think it's a GREAT family night movie! Stopping by from the blog hop! What a fun night it looks like you guys had! I remember family movie night as a kid, great times!!! I just won this movie off a different site. I'm so excited to get it! I haven't seen "Book of Life," but I'd like to! Unfortunately, my son's not interested in watching it, so I may have to see it solo when it arrives on Netflix or cable. One of my favorite family-friendly movies is "Coraline." It's pretty dark (scratch that--it's very dark), but it's really well done and kept me engaged much more than most kids movies do. My daughter was only about 6 when she saw it the first time, and she wasn't that scared by it, so I think it's pretty mild. Hmm...I definitely need to add this to my To Be Watched List. What Mexican food did you have? What a great idea for family night! We just saw that movie this weekend! Our family favorite movie is really anything Disney! Looks like a super fun way to watch a movie!! I seriously want to watch this one. My kids would love it. Looks cute. Family movie night sounds like a lot of fun! We had a family movie night with my in-laws one night the week of Christmas. It was nice to have a low key gathering during such a busy time of the year. I have not heard of this movie, but I'm definitely going to check it out. I am totally in love with those plates in your picture! So fun and festive. This sounds like a great movie, I will definitely add it to my list of movies to watch. I haven't really watched very many family friendly movies in a while. One family movie I want to see that is out in the movie theaters right now is Paddington Bear. What a fun family time! This looks like such a fun time. I haven't heard of this but will certainly put it on my list of what to watch. We like family movie night too and this seems right up our alley! I've actually never heard of this movie, might have to go rent it. The last family movie night we had was "Home Alone". My son (6) loved it, we were laughing at him laughing at it, so totally adorable. I have not seen that movie, but it looks like you guys had a blast watching! I'm not super familiar with any current family friendly films but Paddington Bear looks awesome! I haven't seen the movie but I've seen it online a lot. Your movie night looks pretty cool! Very interactive! !